Lankan born Canadian Tamil, (aka ‘Esthi’), S.Thiruchelvam, former editor of two regional Tamil newspapers in the North, and later a distinguished print and electronic journalist in Colombo, was felicitated in Toronto last week at a function organized by S. Jehatheesan, and Ponniah Vivekananda (both from Canada), Bharathi Rajanatyagam (Lanka) and Prem Sivaguru (England). To celebrate his contribution in Tamil and English, both in Lanka and Canada, a volume of articles both in Tamil and English were published. We met for the first time as two egoist personalities at the Office of the Local Government Service commission way back in the 1960s housed in the 2nd Floor of the Gaffoor Building, Colombo. I had just joined the office as the Tamil Translator, a few days ago. As an avid reader of newspapers, I had seen the byline Thiuchelvam and “Esthi” before but not his face. As I came out of the door to go for my lunch and walked a few yards away I heard somebody shouting “Ush Ush”. I turned back and a person beckoning me to come near him. With my middle-class upbringing, I resented this kind of behaviour from anyone. So I, in turn, retorted the same way and asked him to come near me. He obliged and we make friends. He had come to see me. After the initial prejudices, we became thick admirers of each other. It’s more than 50 years now when some friends are readying to publish a volume on him. It is my pleasure to contribute to this publication. Thiru S. Thiruchelvam to my mind is an indefatigable, energized, courageous man. He was an upholder of what is right and had no fear to fight for his ideals at the expense of falsehood criticisms. He is in the field of mass media more than 50 years both in Lanka and Canada where he settled after the gruesome murder of his intelligent and sportsman young son during the terrorism era in Yaalpaana, (Jaffna). Thiru, as he was popularly called, served as a top-notch journalist writing news stories in effective English for the newsroom of the Sri Lanka Broadcasting Corporation. I was a witness to his writing at that time as one of the three Duty Editors for English, Tamil and Sinhala news presentation. 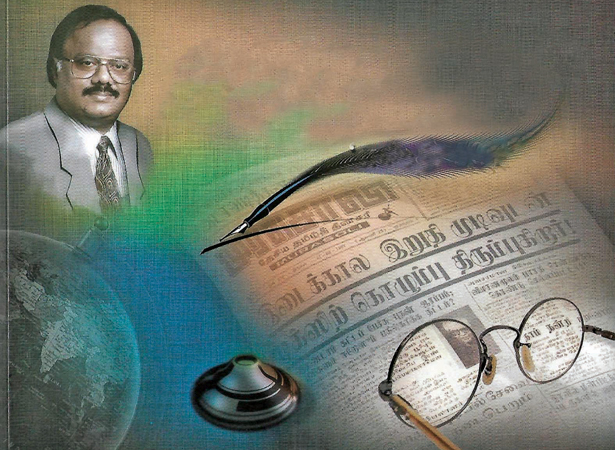 While being a news writer, he also presented a series of ‘development programmes’ on the Tamil Service of the SLBC. In addition, he presented another useful programme where he took pains to get relevant information from the respective sources to answer to listener’s questions relating to public issues. He had a lot of experience in working for a newspaper in Yaalppaanam before moving to Colombo daily, The Thinakaran of Lake House. One remarkable thing is that Thiru besides being a news hunter and editor of two influential newspapers was also a knowledgeable literary man. For more than 14 years continuously he wrote a weekly literary column for the Thinakaran Vaara Manjari (Lake House) with a balanced and comprehensive approach on many matters pertaining to Lankan Tamil Literature and the Arts. He wrote on people, places and events as recording the contemporary literary and arts scene. The immense popularity of his column “Aruvadai” (Harvest) under his pen name Esthi resulted in the formation of Arts and Literary Circle where he and his team organized successfully several functions and felicitation programmes to honour the right ones. Most of his contributions in Lanka remain unknown in the West. He became the founder and editor in chief of Eelamurasu and Murasoli dailies published from Yaalpaanam, after 1983. Thiru was also a meticulous organizer of literary functions and festivals. He displayed his enthusiasm in coordinating activities on many matters that are particular to the community at large. In Toronto, Canada, he is publishing a very useful publication bridging the Canadians and settlers from Lanka. In 2003 he felicitated me with other distinguished artists and scholars for which I am grateful to him and his team. I had always felt that his thoughts, words, and deeds were always positive and in the right direction.His pleasant disposition, positive attitudes and farsightedness disarmed any animosity that some might have had against him by wrongfully estimating him. May I take this opportunity to show my gratitude to him in writing this note and wish him a long life to continue with his current work to make life meaningful to him and the humankind alike.